For over 30 years, Gator BBQ has been delivering mouth watering chicken, pulled pork and ribs to the hungry crowds of Rib Fests all across North America. Touring Canada and the Northern United States, the Smith family of Port Dover continue to win countless awards and events with their signature southern BBQ cuisine. 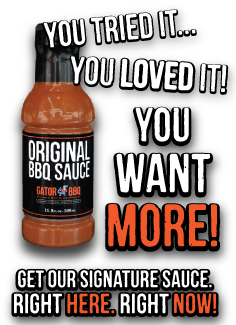 Check out our all new shop and buy some of our Award Winning Original BBQ sauce and have yourselves a Gator BBQ Day at home! Did you know we also cater? Do you have a special event coming up and would rather socialize than slave over a hot oven or BBQ? If meat is what you crave then look no farther. Give us a call today to book your event!